Spring into action! Transition your yard from winter blah to spring-in-your-step WOW. A little time spent on your lawn now will certainly pay off this spring. Spread Delhi’s Fescue Blend grass seed over bare spots to thicken your lawn, wait two to three weeks after seed germinates, mow once, then apply Fertilome For All Seasons Lawn Food Plus Crabgrass and Weed Preventer. Our grass seed blend is specially formulated for the Tri-State area to give you the greenest, healthiest lawn you can get! No need to seed? Start off on the right foot with your established lawn by applying Fertilome For All Seasons Lawn Food Plus Crabgrass and Weed Preventer for up to 6 months of weed control. 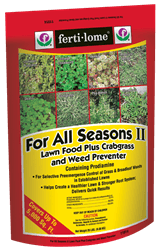 Fertilome For All Seasons Lawn Food Plus Crabgrass and Weed Preventer contains Prodiamine, a pre-emergent herbicide, and fertilizer to feed your lawn nutrients after winter. Last years mulch should be replaced with a fresh layer. Get ahead of weeds in your beds now by applying a pre-emergent such as Hi-Yield Turf & Ornamental Weed and Grass Stopper, then spread the new layer. 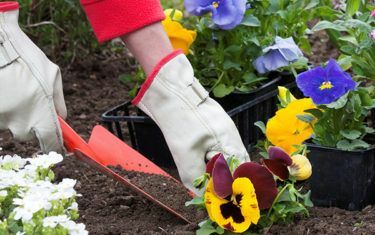 Spring soil is naturally healthy, but by adding a few amendments such as soil conditioner and premium fertilizers, your plants will surely thrive. Ask us what we use or look for the DELHI RECOMMENDS signs in-store. Liven up your flower beds, containers, and window boxes with colorful, frost resistant pansies. Our pansies are locally grown at our plant farm in Indiana. They’re cold grown, so they’re extra tough when temperatures dip low. Once the weather has warmed up, it’s time to liberate spring gardening accessories from storage. Take stock of what you have and make wish lists of any porch pots, window boxes or garden art that might enhance your current landscape. Now is a good time to organize your garden tools and accessories. Pitch anything that’s no longer usable. A broad assortment of spring trees, shrubs and perennials will start arriving this month. If you’ve been making lists or diagrams, you probably have some idea of what you want. This is a great time to stop in and pick our brains for ideas…before the rush! If you think you might like to try new projects this season, good planning now will pay off from now until fall. For example, this may be the year that you plant your own herb or vegetable garden. Take the first step now by deciding on a sunny location, close enough that you can watch new growth and harvest when it’s time (the best part!) If you don’t have space in your yard for a garden, plant a kitchen garden in pots on your patio or nearby. You’d be surprised how many edibles will grow easily in a container.